The Conquest search query is very simple (no disorder, no errors). When applied to the Cambridge structure database (CSD) the following two distributions are obtained. 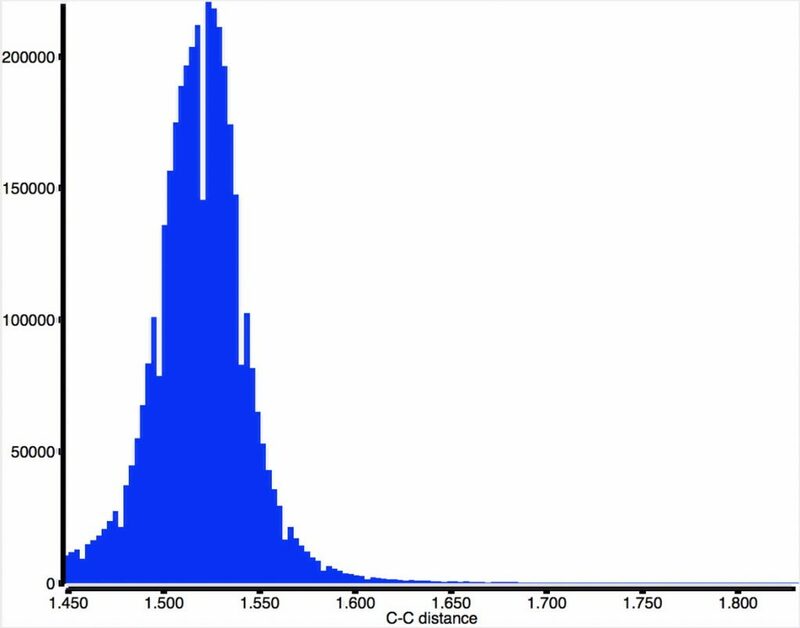 That for carbon is pretty symmetric with the peak at ~1.53Å but with rather faster decay in the region >1.6Å compared with the region <1.46Å (the latter may be caused by hyperconjugation shortening the C-C bond). In contrast, the iso-electronic N-B distribution is more asymmetric about the peak of 1.56Å, exhibiting a long tail beyond 1.63Å, up to a value of 1.825Å. The molecule with that longest N-B bond (1.825Å) is shown below; UWOHUK, Data DOI: 10.5517/ccwcwlp. 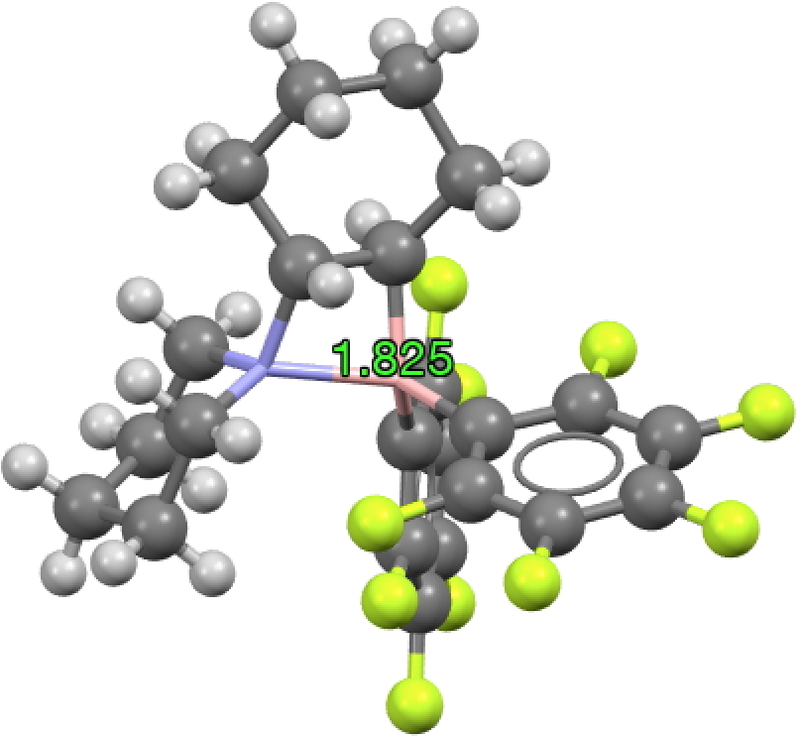 This by the way is no crystal artefact; a calculation (ωB97XD/6-311G(d,p), Data DOI: 10.14469/hpc/3202) gives a calculated length of 1.81Å, with a N-B bond order of 0.48. Stretching a C-C bond heterolytically requires charge separation (a relatively unfavourable process) and likewise homolytic stretching would tend to form a biradical, in effect an excited state and again not favourable. In contrast, elongating the N-B bond reduces (at least formally) any charge separation and allows this heteronuclear pair to sustain (single) bond lengths over the much wider range of ~0.4Å without requiring biradical formation. 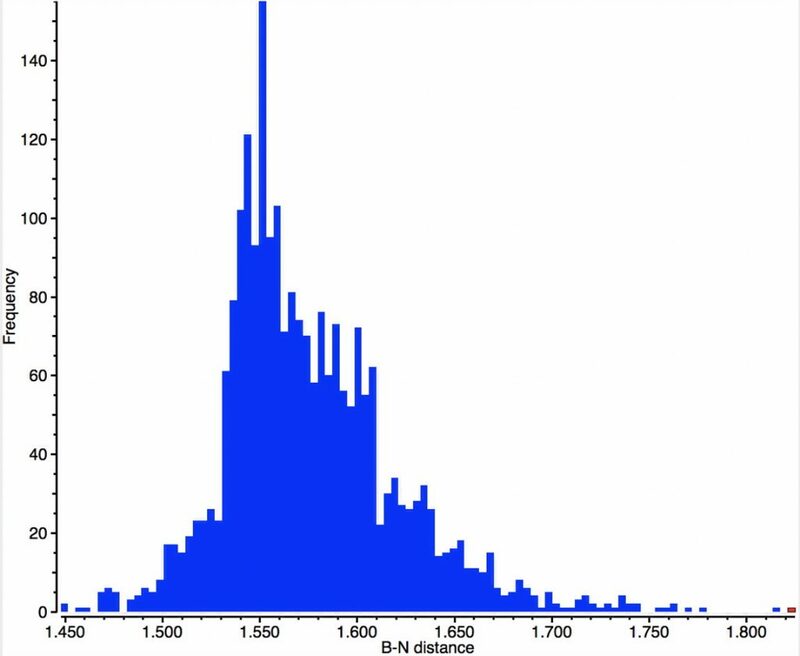 One might wonder what other single-bonded atoms pairs give such unusually large spans in their bond length distributions. This entry was posted on Tuesday, October 24th, 2017 at 5:29 pm and is filed under crystal_structure_mining. You can follow any responses to this entry through the RSS 2.0 feed. You can leave a response, or trackback from your own site. Even in the isoelectronic cousins, CH3-CH3 and BH3-NH3, the difference in the bond length is large (1.53 vs. 1.66Å at the B3LYP/6–311++G(d,p) level). A simple explanation given in DOI: 10.1002/poc.3382 suggests that the B-N bond is much longer due to the relative inefficiency of vicinal hyperconjugation in ammonia borane, as a consequence of the hybridization effects on the H-B-H and H-N-H angles. Yes Igor, this sort of effect does remind us that there is no such thing as a perfectly “pure” single bond (hyperconjugation introducing an element of a double bond). Elongating an N-B single bond is much easier than stretching a C-C single bond. is licensed by Henry Rzepa under a Creative Commons Attribution-Noncommercial-Share Alike 3.0 United States License.